A dad's contribution to the caring of his children can't go unrecognized, especially on Father's Day. And finding the right words to really express what you're feeling goes far beyond just singing your name to a Hallmark card. From traditional quotations to lyrics from a song, there are many places from which to source out-of-the-box inspiration. Do something a little different this year for his special day. The extra effort will be appreciated. From social media shoutouts to handmade cards, Father's Day quotes make dad feel special. You can find quotes that are suitable for use only on Father's Day, as well as sentimental gestures appropriate for evergreen use. Source dad-centric quotes from websites like Quote Garden or Think Exist to express a caring sentiment or add humor to a card. Moms can help their kids source appropriate quotes, too. Letting them pick their sentiment for daddy allows them to participate in the meaning of the day. A poem can consist of just a few thoughtful words or lengthy lyrical prose. Incorporate one into a Father's Day card as a special way of adding a heartfelt greeting or sentiment. Thoughtful and reflective poems, as well as those that are funny and amusing, can be sourced from sites such as Poem Source and Poems for Free. Pick a poem that conveys how you feel about dad, while also complementing the theme of your Father's Day card. A suitable proverb provides a good alternative to long poems or cliché quotations. And since proverbs tend to be short gestures, they are a great choice for cards with limited space. Integrate the proverb into the card's design. Or use a short phrase for beginner writers to practice their spelling. A few mistakes add personalization to a card made by a child. Source Father's Day proverbs from The Holiday Spot or Creative Proverbs and then craft your creation from there. Use a lyric from your favorite song—or from a song dad likes—as an alternative to a traditional greeting. Dad's favorite band may just have the perfect phrase that captures his personality. Is there a song you sing together in the car? Then, Google the lyrics and include them in your card. Or check out SongLyrics.com—a searchable database that includes lyrics from a wide variety of musical genres—for added inspiration. If your father is the type to roll his eyes at sentimental quotes, then add funny words to his Father's Day card. Jokes suitable for a card from the kids can be found at Activity Village and Boys' Life. A joke provides the family a way to get a good laugh in together and it may even spark a standing theme that you'll remember and carry out through the summer. Everyone needs a little humor in life, especially a hard-working dad. 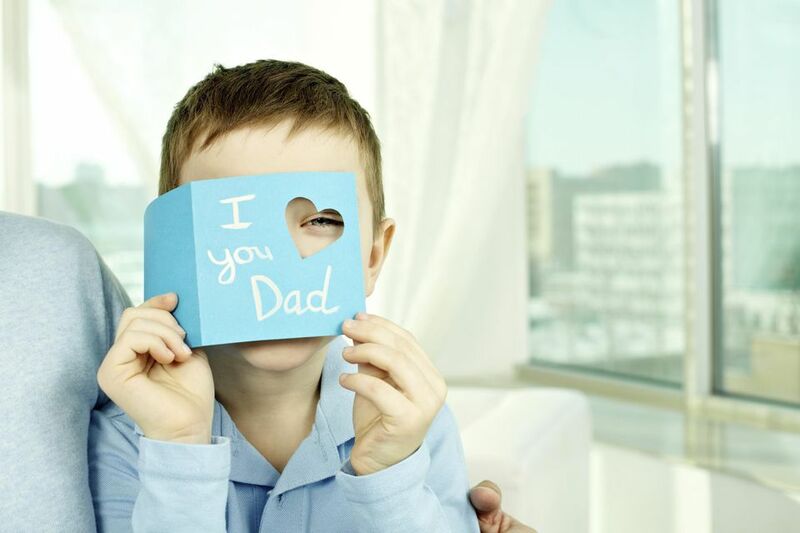 There are many ways of incorporating sentiments into the design of a Father's Day card. For short phrases, purchase rubber alphabet stamps and have kids stamp the gesture onto the card. Or, use the phrase as the focal point of a postcard-like design, then decorate around it with markers, paint, or decals. You can even incorporate sayings into homemade gifts, too. A selection of words and sentiments added to a photo calendar or notebook, for instance, makes an extremely thoughtful and personalized gift.